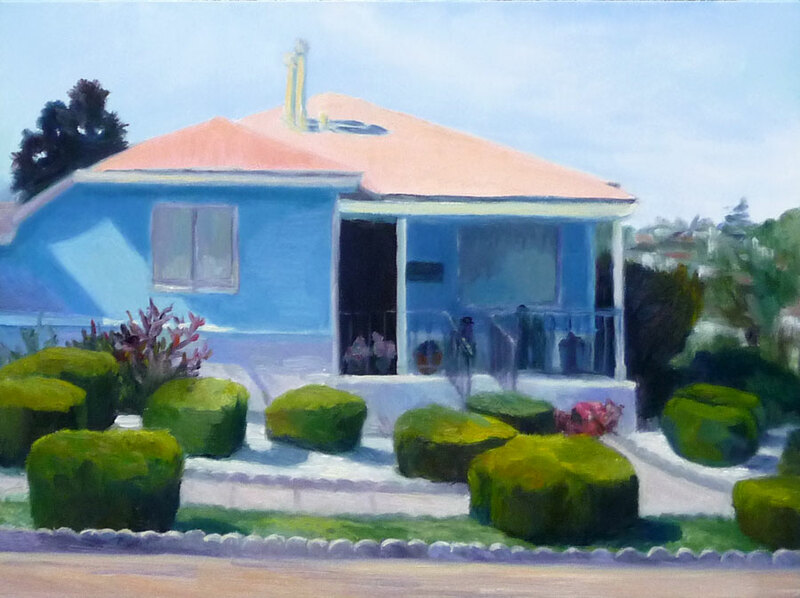 Annex Smurf House, oil on Gessobord, 9x12"
Every time I go for a walk in my neighborhood this house always makes me stop and wonder. It’s painted a perfect Smurf blue and someone obviously puts a lot of care into keeping the juniper tams carved into moon-rock shapes amidst the sparkly white quartz ground cover. But why? Maybe so that one day someone like me would come along and be inspired to paint it. And so I did! It also brings back memories of when I lived in a Smurf house of my own creating. We’d just bought a fixer upper in North Berkeley and while my husband and his brothers did all the really hard remodeling work, my job was to shop for the stuff they needed and keep the kids out of their way. I was sent out for house paint and had in mind a nice Colonial blue. I found the perfect color and had many gallons mixed, not wanting to spend the money to buy a quart to test first. Major mistake! In a neighborhood of craftsman bungalows painted in tasteful earth colors, our little Smurf house stood out, and not in a good way. It’s been a couple of decades since we sold the house and went our separate ways, but the house is still there, and the paint job is holding up nicely and hasn’t faded a bit. I love all your work; haven’t been doing any painting so I even enjoy it more!!!!!!!! I love this painting! Even the shrubs are divided into planes. Wonderful use of colour, too. Really cheerful yet a little quirky. Love the Smurf house and the story that goes with it!